No-Churn Vanilla-lavender ice cream is summer on a spoon! 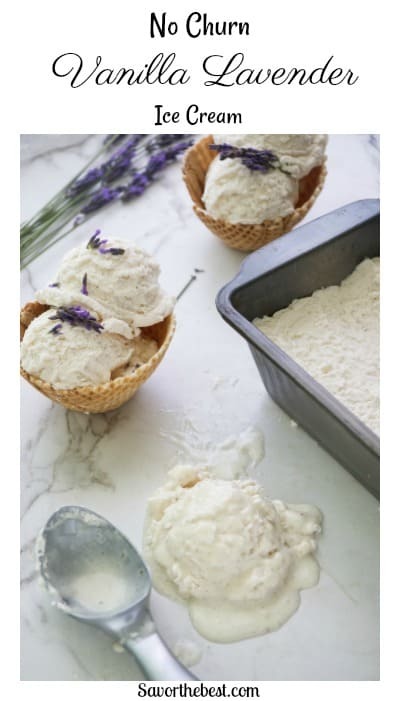 Infuse the fresh floral essence of lavender into a sweet, creamy, no-churn ice cream that is easy to make. 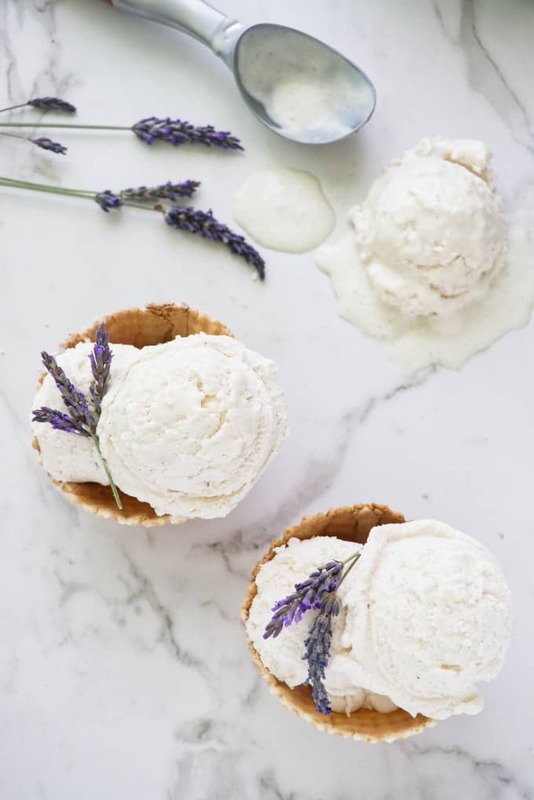 This ice cream will transport you to the serene lavender fields of France. Did you know that lavender can be is a culinary herb? It has a very unique flavor that gives food a special “lift” when used correctly. Lavender has an assertive flavor that can overpower food if not used sparingly. But when used judiciously, it lends a lovely floral flavor that is reminiscent of rosemary. Yet different. It is a difficult flavor to describe and you really need to taste it to understand how uniquely delicious lavender tastes. 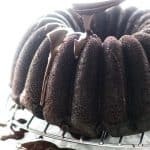 If you want to make ice cream but don’t want to go through the fuss of taking out your ice cream maker then this is the method you want to use. I have tried no-churn ice cream recipes before and it always ends in a puddle of disappointment. When I want ice cream, I want it to be creamy, rich, smooth, and easy to scoop. Churning the cream while it freezes is the secret to that smooth, creamy texture. But Nagi from Recipe Tin Eats has changed my mind when it comes to no churn ice cream. Her latest batch of strawberry ice cream meets all the requirements for good ice cream. And it’s no-churn. The secret ingredient for making no-churn ice cream is sweetened condensed milk. By replacing regular milk with sweetened condensed milk, you reduce the water content and minimize the formation of ice crystals. Fewer ice crystals means creamier ice cream. The other secret to good no-churn ice cream is to use heavy cream and whip it until it reaches stiff peaks, then gently fold it into the condensed milk. 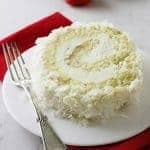 The whipped cream gives the ice cream that light, fluffy, billowy, soft texture. That texture you get from churned ice cream. So, if you have ever tried no-churn ice cream recipes that have left you disappointed, give this recipe a try. It works. If you haven’t tasted lavender, this is such a great way to try it as a flavoring in food. 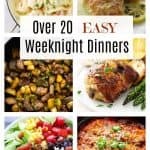 This recipe is easy and does not require any special equipment. It also requires very little hands-on time. The majority of your time will be spent waiting for the ice cream to chill. The lavender buds may be the only ingredient you don’t have on hand but they are easy to get. We got our lavender buds at the Sequim Lavender Festival but in the past, we have bought them at farmers markets and on Amazon. Wherever you get your lavender, just make sure you buy culinary grade lavender buds. You don’t want lavender that has been treated with pesticides. This recipe only requires two tablespoons of dried lavender buds. If you use more than that, the ice cream could end up with a bitter aftertaste. A little lavender goes a very long way. First, you need to flavor the cream with lavender. Simply bring a small amount of the cream to a gentle simmer then add the lavender buds and remove the cream from the heat. Now, give the cream time to soak up all that lavender essence. Make sure you cover the cream so a ‘skin’ does not form on top, then stick it in the fridge for 30 or 40 minutes. 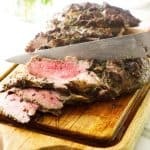 You don’t need to let the cream infuse longer than 40 minutes. As a matter of fact, you don’t want it to steep longer. A longer steep time will only pull out bitter notes from the lavender buds. Trust me, I have done some experimenting. 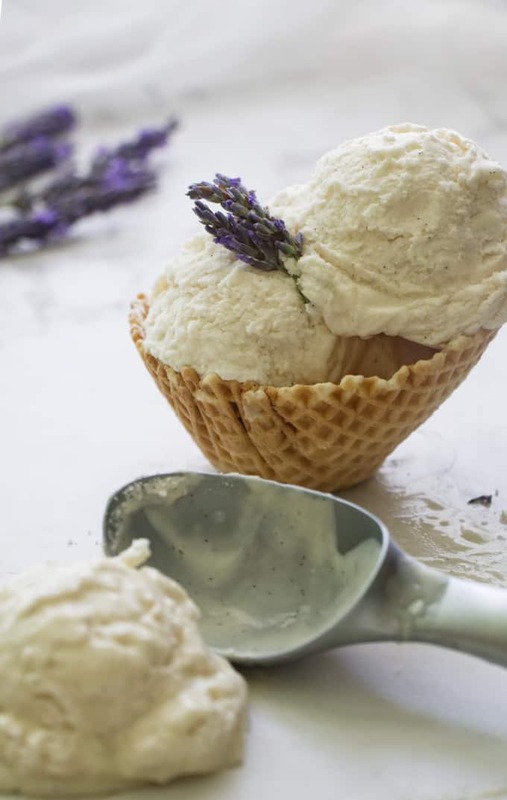 Check out our video and see how easy it is to make this no-churn vanilla-lavender ice cream. 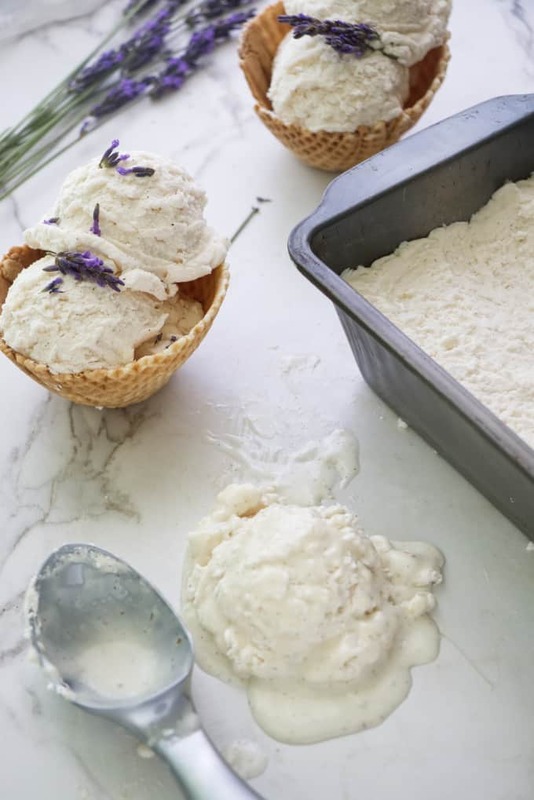 Have you made this no-churn vanilla-lavender ice cream? We would love to hear from you. Drop us a comment below or snap a photo of your ice cream and hashtag it to #savorthebest on Instagram. 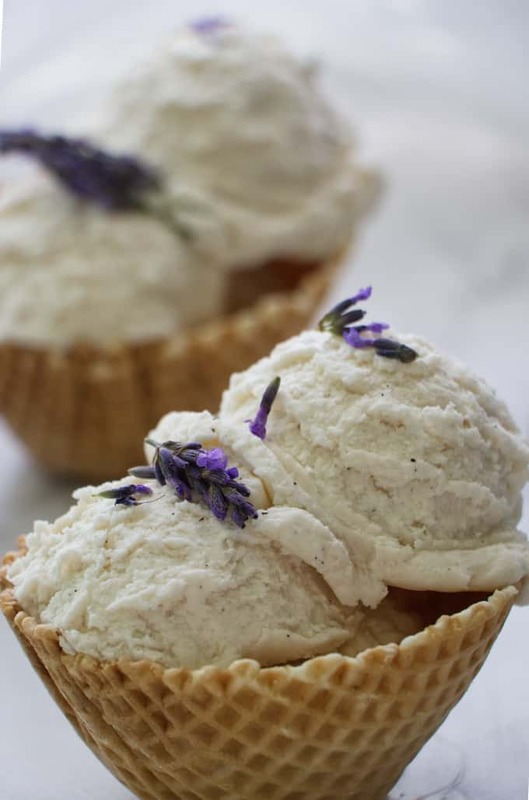 This vanilla-lavender ice cream is infused with the fresh floral essence of lavender. The recipe uses an easy no-churn method to make a creamy, rich, and luscious ice cream. Combine half of the cream and the lavender buds in a saucepan. Bring to a simmer then remove from the heat. 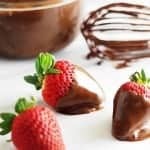 Pour into a bowl, then cover it with plastic wrap and place in the refrigerator for 30 to 40 minutes. Make sure it is cold before moving on to the next step. If it is not chilled all the way then sit the bowl of cream over a larger bowl of ice chips and stir it until it is nice and cold. Pour the chilled cream and lavender mixture through a fine-mesh sieve into a mixing bowl. Discard the lavender buds. Add the remaining 1 cup of cold cream to the lavender-infused cream. Whisk on high speed with an electric mixer until you have stiff peaks. Combine the condensed milk, vanilla and salt in a bowl. Use a wide rubber spatula to fold 1/3 of the whipped cream into the evaporated milk mixture. 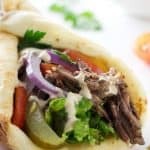 This will lighten the condensed milk and let you fold in the rest of the whipped cream without deflating too much air. Gently fold in the rest of the whipped cream until it is well combined. Pour the mixture into a 9 by 5-inch loaf pan. Cover with plastic wrap and freeze for at least 5 hours. When you cover the hot cream with plastic wrap, make sure the plastic wrap is touching the surface of the cream. This will prevent a skin from forming on the cream. Make sure the lavender-infused cream is completely chilled before you whip it to stiff peaks. Hot or warm cream will not whip. 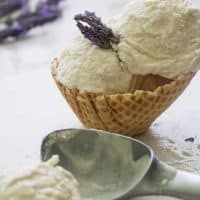 To cool the lavender-infused cream more quickly, you can set it over a larger bowl with ice and stir until it is cold. 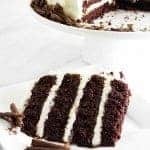 We used vanilla bean paste which gave the ice cream a scattering of vanilla bean seeds throughout the ice cream but you can substitute vanilla extract. I just bought a bag of lavender and now I know what I’m making with it! oh, you definitely can’t go wrong with lavender ice cream. There is something about dairy and lavender that makes such a great combo. Wow, I envy you! Picking lavender straight from your garden in France!! What a dream! OMG, this ice cream is screaming Summer! Vanilla and lavender ice cream sounds delicious. I’ve never made no churn ice cream before — because I have an ice cream maker, but this really does sound like it would be delicious. I love the use of lavender. Where do you source yours? I love how simple, yet elegant this ice cream is! A real treat and so, so pretty too!